The Silver Lotto System has been around since the 1990’s and has been thoroughly tested many many users over the years, so does the Silver Lotto System really work? The truth is NO! The Silver Lotto lottery system is totally a made up system by Ken Silver and simply has no winning value. All real verified legit tests done on Ken Silver lotto system showed extremely poor winning results, there is nothing special about this Silver Lotto e-book, it’s just old common lottery wheels that have no real math involved, as to allow them to work correctly. Ken Silver would like to make you think he is the world’s leading lottery expert by feeding you a bunch of false advertising, like claiming he was a big lottery winner, winning 2.7 million, yet cannot give you actual proof of this, makes no sense. Instead Ken Silver shows you on his Silver Lotto Website, groups of so-called winning lottery tickets he won using his own silver lotto system, but he fails to make the photos clear and zoomed in, so you cannot see if they are winners or not. Why does he do this? It’s because these are not winning tickets, just his losing tickets. Also all the testimonials on his website are totally fake! Almost everything about the Silver Lotto System and Ken Silver is a complete LIE! If you browse lottery forums, blogs etc, you will find many posts about Ken Silver and his Silver Lotto System being talked about, all bad reviews. What people do not understand is, this Australian Ken Silver is a scheming marketer, he sells products that are useless, so he needs to write false reviews which there are many and needs affiliates to sell his system as it’s the only way the system makes money, not by winning lottery draws. All legit lottery review sites report Ken Silver as an untrustworthy seller, who actually specializes in selling useless lottery systems. Big Warning to all thinking about using Silver Lotto System. Do not give Ken Silver your credit card info, many people reporting the cards are being billed over and over without authorization. Do Not believe the Guaranteed refund, it is rarely honored. Once Ken Silver has your money, it’s to late! You can checkout legit lottery system review websites to verify all that I say is 100% true. There are more review sites just search and you will find then if needed. The biggest test don on the Silver Lotto System was by a person who used the system for about one year consistently, but did not use real money. He just wanted to seriously give this Silver Lotto a solid test. In the one year’s time the Silver Lotto system won about $250 in winnings, but would have cost over $2000.00 in lottery tickets to win that $250, so again this Silver Lotto System is not worth using. Below is the official results of the 2013 best winning lottery system poll. 21 best selling lottery systems were entered, you picked which system worked best by placing a one time vote (anti cheat was in effect) Click on the photo to enlarge. Look at where the Silver Lotto system placed. No one voted for the system at all! It received 0% of the votes. If the silver lotto system worked as well as Ken Silver claims it does, I’m sure at least it would have ranked much higher correct? 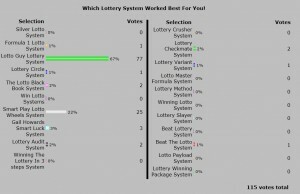 The winning system was the Lotto Guy Lottery System which also won the 2012 lotto system poll and clearly shows users win using it. Sorry, but Ken Silver’s silver Lotto System is a losing system once again and polls are solid proof! This is simply a No Brainer, the Silver Lotto System is a falsity, just a money making scheme! This entry was posted in Lottery and tagged ken silver lotto, ken silver lotto system, silver lotto, silver lotto review, silver lotto system, silver lotto system download, silver lotto system review, silver lotto website by Lotto. Bookmark the permalink. Great advice mate, was not aware of all of this B.S about silver lotto system, you showed me the real truth, makes sense. Yup, the only people recommending this silver lotto system are the sellers/affiliates, so you are correct. On our blog members have had no luck at all with the silver lotto system, it’s a very poor winning strategy to say the least. Ken Silver has also been caught by review sites using fake tesimonials as well. Did you know 65% of customers seek a refund within 60 days for his silver lotto system. Ouch! No wonder he is not honoring refunds, he just keeps ripping off people. Winning the Lottery is not a ROCKET-Science. Anyone can do it! This is what Ken Silver told me, but only if I used his silver lotto system. I asked to see proof of his winning tickets, he told me some crazy story as to why he cannot. Then wanted to push me into the sale, I backed out and did a search on him, found some nasty reviews about him. I was to smart for that con man! I have tried a few lottery system with little to no success, but the silver lotto system has got to be the worst system of the group. I lost sooooo much money with the system, it definitely is a money making scheme system. Win 8 out of 10 games as claimed by ken silver is not true, not even close. I also recommend people avoid this crappy silver lotto system, I rate it a 0 out of 5. One must be blind to believe the claims ken silver states for his lottery systems, been there done that! His systems are a JOkE! If you think you are going to win the lottery using a common system as ken silvers you will believe anything! How can a publisher such as Ken Silver, put together a winning system that suggests a 98% win rate when real lottery professionals can only produce systems with 30%-40% win rartes? It does not add up. Silver Lotto e-book wheeling system is rated very poor by sooooo many people, you would have to be a 5 year old to believe this clown! I never would have thought the silver lotto system would be misleading, I would now agree with your review on the system. I’m starting to see things differently than what the sellers want you to see. You make some very good points about the silver lotto system and after doing some research myself you are dead on! I love this article you tell it as it really is. No lottery system will give you a 98% win rate, that should be your first clue it is a scheme. Really good post! I agee with you about Ken Silver 100%.